For the first time in generations, citizens of the Federation know want, uncertainty and fear. Bloodied yet unbowed, the Federation stands on the edge of a precipice. 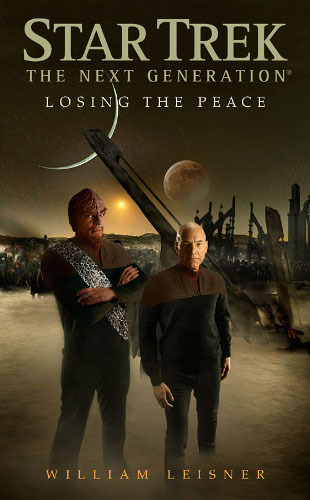 As he battles to rescue the displaced and the desperate, Captain Jean-Luc Picard is forced to wonder whether those who know how to win a war can ever make a good peace. The latest novel in the Next Generation continuation series is a lot calmer than the preceding destiny trilogy and Borg based novels beforehand. It's a welcome change of pace to a more diplomatic and political theme rather than war, war and more war. Captain Picard and his crew's new mission is to assist in the rebuilding efforts as a roving troubleshooter, while Dr Crusher heads up her own team visiting a refugee camp on a water world. Although it is the second in the political line in a row it still feels more like a traditional next gen novel, though fans of action and giant space battles will be disappointed as we've definitely moved beyond that for a while. The new crew seems to come together in this one for the first time, although it's not entirely clear which of the new characters are going to be main characters and which just supporting. All in all I enjoyed it as a quick read but it has nothing of the impact of the destiny series. I don't even know when we'll be returning to the next gen or where they are planning to go next.